“It is obligatory on every mukallaf, man and woman, to ward off danger from themselves, regardless of its source, be it from another human being or animal, or anything else (natural)” says His Eminence, Sayyed Muhammad Hussein Fadlullah (ra) in his book, The Manifest Edicts. With the growing rates of violence against women, it becomes imperative that a woman wards off danger and tries to protect herself. 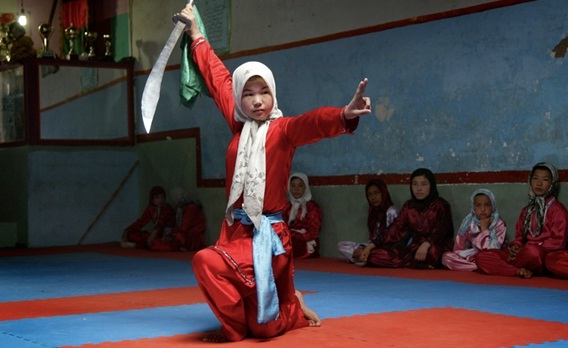 In India, a growing number of Indian Muslim girls have been joining self-defense programs to develop their marital skills, eyeing more opportunities for employment in the future; as mentioned in OnIslam.com. Martial arts performance is being held in the Muslim majority village of Kanodar in Banaskantha, a district in Gujarat state.Hundreds of girls participated, expressing a great infatuation with the practice. The crowds were amazed at the Judo and Karate exercises held by the girls in the village.”We have got demonstrated some attacking exercises that can come handy for self-defense,” said Khushbu Prajapati, a trainer at the program that was named Padkar (Challenge). 1082 school gilrs attended the nine day self-defense program which was organized by Gujarat Sports Academy (GSA). In the beginning, there was a hesitation among the girls to attend the self-defense program as expressed by Ismat Chaudhary, a class Xll student who attended the self-defense program. However, “it was exciting to defeat an opponent." The issue of selfe-defense is one of major significance as we live in a world of turmoil, clashes, and fear. Self-defense and all that which is aimed at preserving one's life are intrinsic urges. Thus, the Shari'a has made it lawful and obligatory on the mukallaf to comply with. Furthermore, with reward for practicing self-defense and punishment for abandoning it, the Shari'a has stressed its importance for it aims at man's property, progress of nations, and peace and security of the human race. The importance of this sacred duty is not less than that of enjoining good and forbidding evil, if it does not outstrip it. By taking to the former, we aim at defending the faith and moral values; by practicing the latter, which is a defensive jihad, we mean to protect the very existence of the human race society, and the homeland, hence the plethora of Quranic verses and traditions (hadith) which talk favorably about this topic; parallels have often been drawn between jihad and striking a deal with the Creator, in that embarking on it would open up a special gate to Heaven, which Allah has reserved for the elite among His creation. It is obligatory on every mukallaf, man and woman, to ward off danger from themselves, regardless of its source, be it from another human being or animal, or anything else (natural). Other dangers which one should guard against are sexual attack, attacks aimed at denigrating the human integrity and honor by way of adverse attitude and perhaps rude language, which could lead to ridiculing, upsetting, or harassing the victim, and any other moral injury. Defence is not exclusive preserve of men and youth, rather it covers all people according to their ability and the level of defence; men and women, old and young, the healthy and the sick are all included. However, if sufficient numbers of defenders take it upon themselves to do the job, the rest are absolved of the responsibility. 183. The obligation could be of the wajibun aini type, i.e. for those with specialized expertise who are vital for the effort. Such must take the initiative in volunteering their services; it is not permissible for them to be apathetic or dodge their responsibility. Indeed, it becomes obligatory on those of them who live outside their homeland to return to do what is required of them. Thus, Islam does not wish to raise meek and submissive individuals, but rather ones who would defend themselves, honor, and land.